We began our morning by boarding the Sonic 1 Limited Express to Kitsuki. The designers of the rolling stock were clearly influenced by Yuji Naka in their choice of headrest, which was a positively hideous blend of red, blue, and green. Our journey took us through Green Hill Zone and Labyrinth Zone, and right before Kitsuki it could be argued that we passed through Final Zone. We took a taxi from there to the park. Our driver bore no resemblance whatsoever to Dr Robotnik. 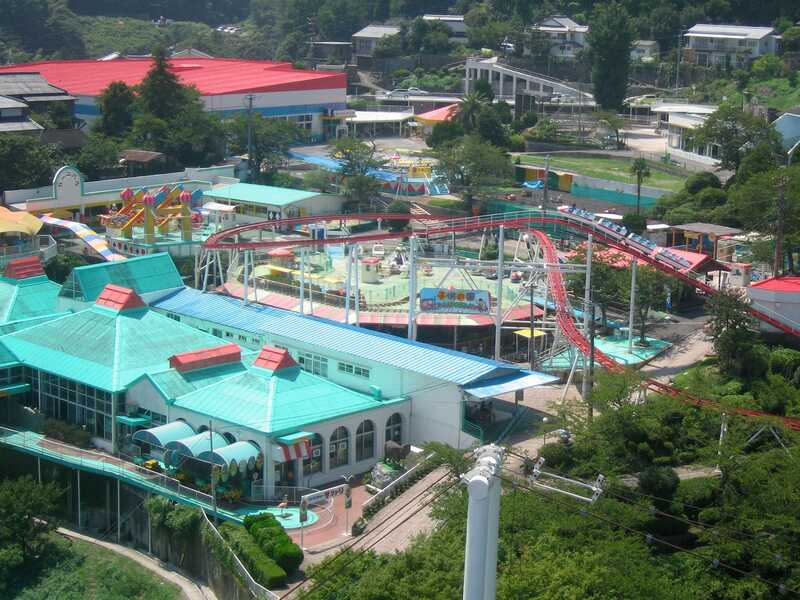 Harmonyland is a children's park themed around Sanrio characters, and Hello Kitty in particular. Our visit today was memorable chiefly for the fact that utterly rancid local pop music was playing on loop throughout the place, causing us to gradually lose the will to live. Enthusiasts planning their own visit would do well to visit with ear plugs; we'll be bringing our own sets if we ever return. 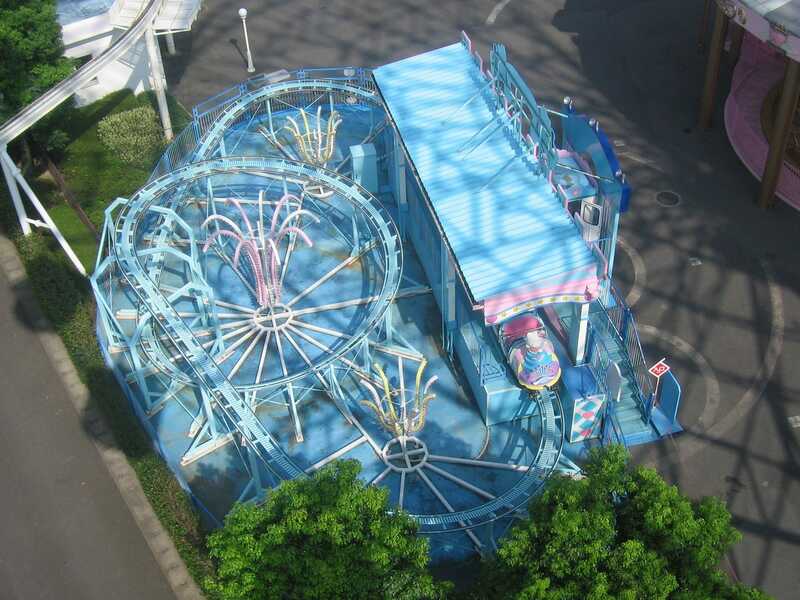 We began our visit with the powered Hello Kitty Angel Coaster, a Zamperla machine with a single descending helix. The train featured a cute cartoon figurehead and tail in place of the usual red dragon, but otherwise was the same as the standard model. Once we were seated the ride operator took the time to annunciate a rather long safety announcement in Japanese, demonstrating an admirable respect for regulations despite the fact that the only two passengers on board obviously had no grasp of the language whatsoever. Our looks of polite incomprehension earned a smile and a single lap of the track that took almost thirty seconds to complete thanks to an underpowered motor. The operator on the Hello Kitty Ferris Wheel spoke passable English, which she used to warn us that a lap would take ten minutes. She somehow neglected to mention that there was a speaker system on board playing a thirty second loop of the aforementioned horrible music, which quickly began to drill into the depths of my brain. The windows on the enclosed car looked to have not been cleaned in the previous century, and we were just about to consider the ride a complete write-off when it became apparent that one of them opened just enough to lean a camera out. The photo angles were not great, but they were better than nothing. Our next stop was at Rhythmical Coaster (#559), a family ride that started out reasonably well before going on a wide, sluggish, and mostly flat circuit around the main entrance area of the park in trains themed to look like roller skates. The interactions with the surroundings worked well, but it would have been nice to have a little variety in the layout rather than large portions of straight and level tracks. A few hills would have made an enormous difference and would have used up some of the speed that we lost on the brake run. One curiosity in the park is its Train Ride. There is no motor on board the vehicle, which runs on track that at first glance bears more than a passing resemblance to that used by Arrow Dynamics. 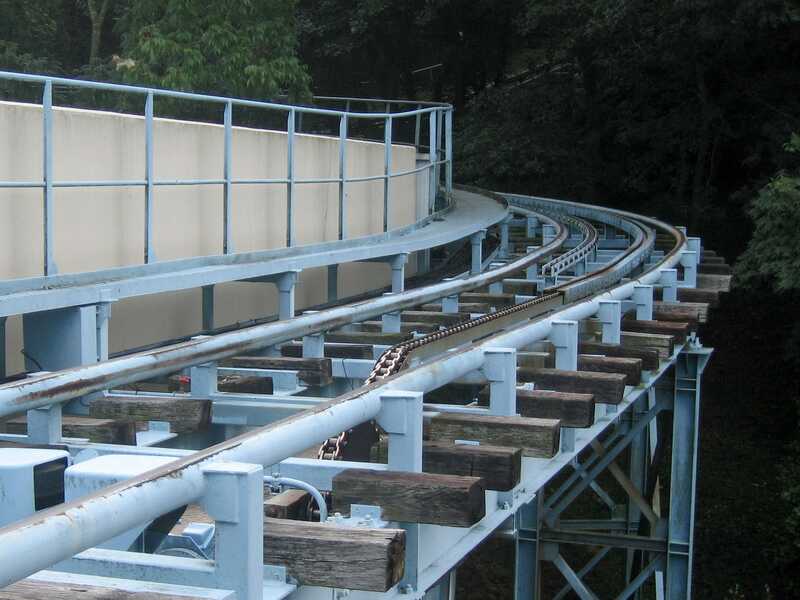 The descent, through hills into a valley at the base of the park, was lined with brakes throughout to prevent speed being built up. The ascent from the lower station involved a chain lift and anti-rollbacks for the better part of the journey ahed of a small momentum-powered descent of around three feet into the station. I've decided not to consider it as a coaster as the experience is too slow and controlled to be thought of that way, but it does meet all the standard rules. As ever with something like this, you should count whatever you like (though the rest of us reserve the right to make fun of you). The journey down the hill turned out to be well worthwhile. Tucked away at the base was the Sanrio Character Boat Ride, an absolutely superb dark ride. My knowledge of Japanese cartoons does not extend as far as these characters, and the storyline was in Japanese only, precluding any recovery on that front. Nevertheless, the experience felt like a non-tacky version of the famous It's a small world attraction at Disneyland California. Each scene was lit up in turn as the boat passed it, and this served if anything to enhance the experience as there was no temptation to look at what was ahead. We took the train ride back up the hill again and made our way to the exit, where a taxi was just passing. We'd have been in trouble otherwise; future travellers would do well to ensure that they have please call us a taxi or the like written in Kanji in case you find (as we did) that the guest services staff don't speak English. We were waiting at the express platform for the high-speed train from Kitsuki to Beppu when someone in a Japan Rail uniform climbed out of the driver's carriage in a stopped train and approached us, talking animatedly in Japanese. When it became clear that we did not understand the local patois, he managed to tell us that "Express Has Trouble", indicating that we should take his train instead. Would the same happen on Iarnród Eireann? I sincerely doubt it. We took a taxi from Beppu station to Rakutenchi, or rather to a Funicular Railway that would bring us up the side of the mountain where the park was located. We were able to purchase a combined ticket for this and park admission, and we had been on board no more than ten seconds when the carriage started moving upwards. As we rose into the hills I had one overpowering impression; this park was the local version of Tibidabo. It may have been on a smaller scale, but the location couldn't be bettered. The view from everywhere in the park could only be described as spectacular. Unfortunately, the view was the only positive impression I took from the Jet Coaster (#560). The ride began badly with a painfully slow lift hill which took over ninety seconds to raise the train to a height of around fifty feet. I had managed to shoehorn myself into the ride by adopting a crosslegged position, and this came back to haunt me; the cars had the cornering ability roughly equivalent to that of a race car with a puncture, and my knees took a severe beating on every turn. Once was definitely enough, and made me realise that I am tall in the land of the short. There was a ¥100 charge to walk across a lengthy rope bridge spanning the park, but we both agreed that this was worth it, both as the best possible location for photography and also as somewhere to stop for a few moments to appreciate the environs. We were able to pin point the location of the train station we had started at, and decided on the spot that we would be walking back, as it could not be more than a mile away in roughly a straight line. Before leaving, however, we took a spin on the unusual Double Ferris Wheel. This consisted of two small wheels mounted on opposite ends of a large arm, which rotated slowly and continuously along with the two wheels. The ride experience did not feel any different to that of a normal wheel, and loading efficiency was limited by the design, as no cars are in the station for half the rotational period of the wheel. This probably explains why I've never come across one elsewhere; though a nice idea in theory, in practice traditional ferris wheels are easier for parks to deal with. Following our walk back to the train station we were faced with another conundrum, namely how to identify which set of pretty pictures we needed for the bus to take us to Kijima Kogen. Once again the lost gaijin were rescued by a helpful local, in this case a woman who could not have been less than seventy-five, who proceeded to tell us in perfect English which stop (and which bus number) we would require. For the third time in as many days a local had come over to us, unbidden, and told us what we needed to know in our language, making us realise yet again what a wonderful country Japan is. For those attempting to retrace this trip, bus stop one and either #36 or #37. The bus stop for Kijima Kogen was announced over the PA system as Korakuen. An announcement was unnecessary though; the extra large ferris wheel, seemingly a staple of all parks in this country, had been visible out the window for the previous ten minutes, along with several of the other attractions. We began our visit with Super LS Coaster (#561), Meisho's version of the standard loop and corkscrew design. This one ran pretty smoothly with only the occasional jolt, a definite upgrade from the installations by Arrow and Vekoma. This was fortunate as we were completely shoehorned into the train with no room to spare whatsoever, meaning that we felt every last bump. The main reason for travelling to the park was Jupiter (#562), currently the fifth longest wooden coaster in the world with just under a mile of track. Today it was operating with a single train, something which shouldn't have been a major problem given the number of people in the park. However, the painfully slow loading process resulted in a completely unnecessary thirty minute wait. Trains were being dispatched at the rate of around one every six minutes, resulting in a capacity of no more than three hundred per hour. This would have been less than ideal on a small coaster, and it was completely inexcusable on a signature attraction such as this one. The one positive thing to say about such slow loading is that it probably served to reduce the number of people the coaster could hurt in any one operating day. I have been on rougher wooden coasters in my career, but not many. The tracking was at best haphazard, and the problem was exacerbated by the heavy lap bar restraint which left substantial indentations in my thighs on each jolt. The layout looked to be interesting enough, but it wasn't possible for me to appreciate it properly; I found myself bracing for impact instead, and I wasn't at all sorry when our lap came to an end. 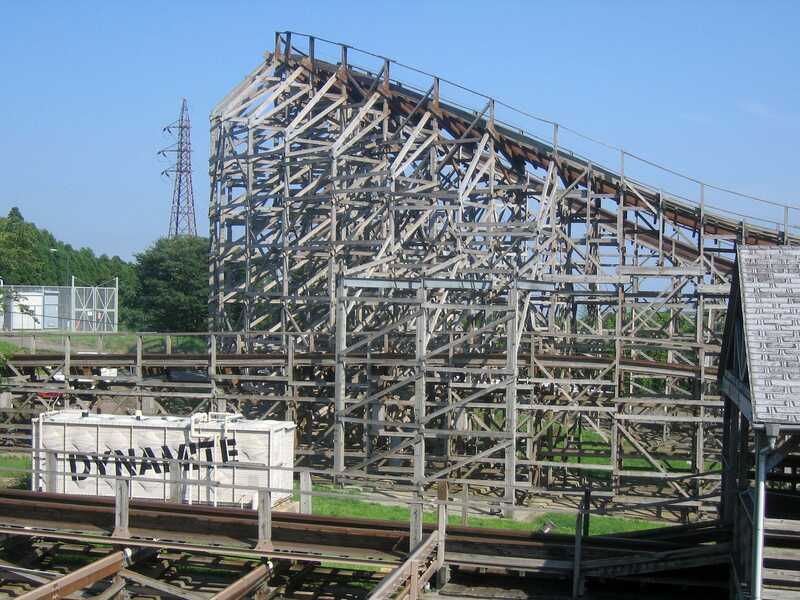 The ride has an electrical building next to it labelled dynamite, pictured above; it would be no loss to the world if someone detonated it. We decided to recover on Newton, a second generation Intamin tower with no seat belts named after the famous English physicist. The queue was in the shadow of a relatively small skycoaster, and we passed our wait time watching as the operator yelled the usual encouragement to riders in Japanese, followed by the obligatory countdown with a uniquely Japanese twist; 3, 2, 1, FRY! We've realised over the course of two days that Japanese people have serious difficulty distinguishing the letters L and R. In order to fit in properly with the local culture, we have developed a new multipurpose obscenity which we'll be using for the duration of the trip: Borrocks! The powered Dragon Coaster was nominally a clone of the one ridden earlier in the day at Harmonyland, though it was far more enjoyable as we were treated to three circuits at the usual speed. With that done we decided that we might as well check off Roller Skater (#563); the only interesting thing about the ride experience for me was that I can now legitimately claim to have ridden the 207 metre junior coaster from Vekoma in six countries. Vending machines are everywhere in Japan, and they sell everything from comics to second hand underwear. Theme parks are no exception to this rule. 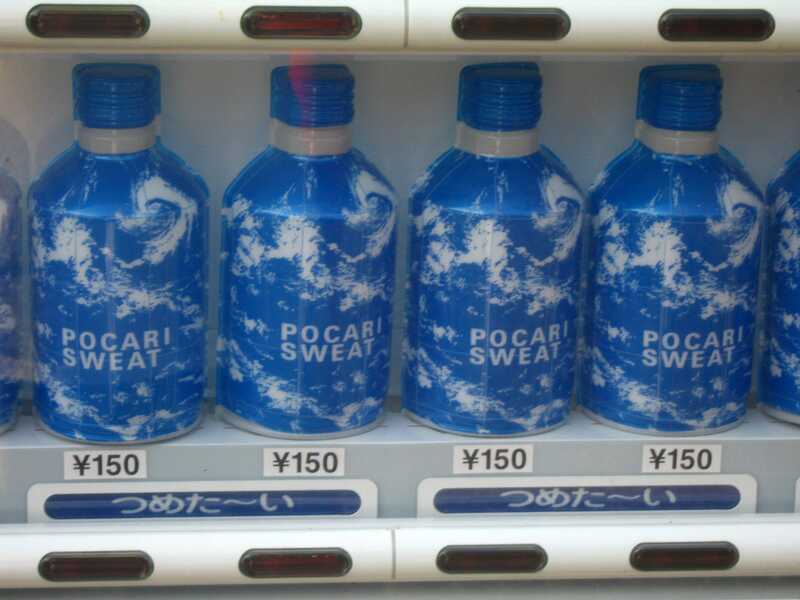 I'd decided early on in this trip that I'd avoid wasting valuable photo card space on irrelevancies, but my resolve broke when I saw one full of the local energy drink, Pocari Sweat, best described as a Gatorade equivalent. If the manufacturers ever want to sell in the western world they would do well to develop an alternate brand name. We had an interesting conversation in somewhat broken English with some locals in the queue for Gold Stampede (#564). It began when they started standing on tip toe to try to make themselves as tall as us, a difficult challenge at the best of times. We tried to make them understand how long we were visiting for, but it seemed that we'd reached the limit of their English; in the end I opened up the calendar on my mobile phone, and they picked it up from that. They were disbelieving when we told them how many theme parks we had been to, and remained so for the most part even after we had presented a few ticket stubs. The ride looked promising but proved a disappointment, as the trains were even smaller than those on Super LS Coaster, meaning that we had to contort ourselves to get the restraint to close. This meant that every jolt was transferred directly to my knees, and there were a lot of jolts. The Ferris Wheel was fitted with two completely unenclosed cars, with riders secured by OTSR restraints that would not have been out of place on a roller coaster. We would have liked to have tried this for novelty value, but there was a dedicated queue that looked to be over an hour in length. Instead, we decided to conclude our day with the Haunted House walkthrough.